Somewhere around December or January, my weight, seemingly suddenly, jumped a couple of pounds. This triggered an alarm as I felt like I was already on the high end of what I considered an acceptable weight for me. At the same time, I recently got to know Samir Damani and his company, MD Revolution. 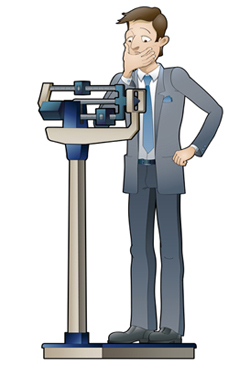 Samir has taught me, among other things, that weight is not as important as some less consumer-friendly measures such as VO2, metabolic rate and visceral fat. As I became familiar with the MD Revolution team and their approach, the offering intrigued me. 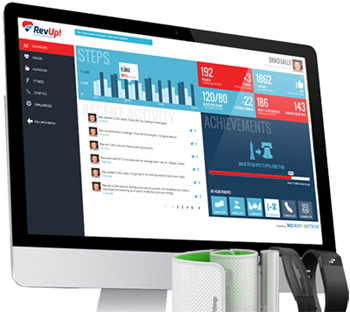 It is a tour-de-force that integrates a number of consumer apps and devices as inputs (Withings, Fitbit, MyFitnessPal and others) with a high-touch coaching component that involves nurses, dietitians and exercise coaches. Their results so far have been impressive (I should note that MD Revolution is in late stage discussions to trial their product in the Boston market in collaboration with the Center for Connected Health). Given my own desire to drop a few pounds and my growing interest in Samir’s approach, I decided to sign up. As you might guess, I’ve been a fan of tracking for years. Heck, in 2009 when Withings released its first scale, I purchased one and, for good measure, began tweeting my daily weight! (There was no social media outpouring at that time, but that’s a story for another time.) Activity trackers, blood pressure cuffs, scales – you name it I was tracking it. Over the years, as the Center for Connected Health studied these trackers, we developed three “truths we now hold to be self-evident.” One is the power of feedback loops. When new, these trackers have a way of providing great insight into one’s behavior. Those who use an activity tracker, for instance, almost universally report that they did not realize how inactive they are and how much that motivates them to be more active…for a while. That effect wears off pretty quickly though. The second truth is a corollary. Objective evidence is much more powerful than self-reported data – we unconsciously report those readings that make us look good and ignore those that do not (this is called social desirability bias). The third truth is that some sort of motivational overlay is required to keep us interested/engaged in the feedback loop past those first few weeks. This is where all of the excitement over games, incentives, social influence and coaching comes in. One of the reasons I am so enamored of MD Revolution’s approach is that it combines feedback loops and coaching – a winning combination according to our experience at the Center for Connected Health – but I had not applied these principles to diet tracking and when I did so, I found some interesting nuances. For some time, I turned my nose up at food diaries in general because they take a lot of effort to use and are subject to social desirability bias. 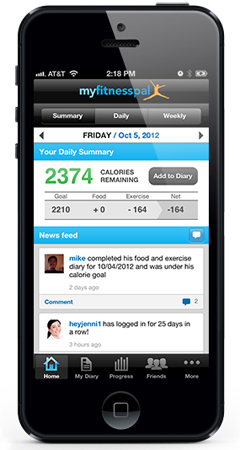 My health coach at MD Revolution coaxed me into using MyFitnessPal for a couple of weeks. This experience led to a number of insights about eating, food tracking and the need for an objective calorie intake sensor. First, tracking my diet and sharing with others (even a nutritionist) is the most personal thing I’ve done. I can’t say why but this feels way more invasive to me than tracking any number of vital signs. Getting feedback about the amount of chocolate I eat in the evening, for instance, felt quite ‘up close and personal’ to me. I’ve also been resistant to the advice of my nutritionist. I was of the mind that I eat a well balance diet. I live with a vegan who is quite obsessed with nutrition. We have a high fiber, low fat diet. Of course I have been ignoring the objective evidence that this diet, along with my activity level, is resulting in a very slow weight gain. Somehow that floats to the background of my consciousness. It’s hard to psychoanalyze oneself, but I think there is a bit of denial going on here. MyFitnessPal is the leader in its class. It has many features that make diet tracking easy, like a bar coder and ways to log meals or recipes once and repeat them by simply checking one box. On top of that, they’ve been very successful at attracting an audience. They are to be congratulated. Still, it is time consuming and prone to bias. For instance, I stopped tracking because, as I say, it feels too invasive. It would be great to have a system that would passively keep track of calories in. Still waiting for that one. But with this recent experience, I now feel that even if we had this technology, it would take a lot of extra effort to get individuals to use it. Food is so personal; so emotional – it is much harder to deal with calorie tracking than tracking other aspects of health. This is why I’ve decided that engaging, accurate diet tracking is the ‘last mile of connected health’. So how have I done so far? It’s only been a couple of weeks, so too early to tell. I have definitely increased my activity. No change yet in my diet. Let me give it some more time and I’ll report back. What relevant experiences have you had? How can we make calorie tracking non-threatening or even fun? I share your enthusiasm for using cameras to capture health-related info. As applied to meals, this concept goes back to the middle of the last decade when ‘Myfoodphone’ launched enabling people to take a picture of their plate and get a nutritionist’s feedback. The big hole in this one is the possibility of selective photo taking (take a picture of the salad but not the plate of cheese cake). Easier than diaries but not perfect. I agree, we have to exercise great skepticism and caution. I did Lose It for 5 months. It became a labor of love. Very arduous. I, too, developed realizations, like I drink too much alcohol. Though I was proud of my 15K+ steps/day; I was losing any weight loss opportunities with the empty calories in booze. So it was – as you described – helpful and eye-opening. Rick: your perspective on this is so rich compared to others. Thanks for taking the time to comment. I sase this too. I hope it pans out. Beyond the challenges of accurately capturing what one is eating/drinking and motivating them to change, you also have the challenge of the complexity of nutritional biochemistry and how such biochemistry interacts with our biology. Take for example your statement, “Of course I have been ignoring the objective evidence that this diet, along with my activity level, is resulting in a very slow weight gain.” If you are referring to a low-fat, high fiber, vegan diet as a cause for very slow weight gain I would point you to the work of Ornish, Mcdougall and Esselstyn, etc. Ornish in particular has published numerous studies that provide evidence that subjects lose weight and lower their risk of a host of chronic diseases through eating a low-fat, high fiber, mainly-vegan diet in combination with other lifestyle changes. That being said one could argue in support of other dietary patterns as being effective in losing weight based on other published studies. So which one is right? Again my main argument is that we still have much more work to do to understand why one person responds well to a certain dietary pattern while others do not. Part of the problem with nutrition research is that it is very difficult to accurately capture what people are consuming and thus a passive, accurate nutrition tracking would be very helpful in improving our understanding of how what we consume effects our health. which will help give your metabolism an added boost while on the.